Chocolate in surprisingly small amounts can seriously affect your dog, and in some cases cause your dog to die. Small animal veterinarians are seeing increasing number of dogs with chocolate toxicity as more of us are eating the ‘healthier’ dark chocolate. Unfortunately your dog only needs to eat 1/3 as much dark chocolate as opposed to milk chocolate to become seriously ill. In this article I will show you why chocolate is toxic, the types and amounts that will cause poisoning, the symptoms of toxicity, and what you can do if your pet consumes chocolate. The toxic components in chocolate are caffeine and theobromine. The theobromine is found in high concentrations in chocolate, and causes most of the clinical signs in dogs. Theobromine affects your dog’s intestinal system, nervous system (brain), cardiovascular system (heart and lungs), and the kidneys. The symptoms of chocolate poisoning in dogs are based upon the amount of chocolate eaten, the type of chocolate, and the time since it was ingested. The most common sign after your dogs eat chocolate are gastro-intestinal, meaning stomach upset, bloating, vomiting and diarrhea. Not uncommonly you may see hyperactivity, restlessness, elevated heart rate and increased drinking and urinating. The most serious signs are when the nervous system is affected; these may show up as tremors, seizures, increased breathing rate, high body temperature ( hyperthermia) and coma. The toxic and potentially fatal dose of chocolate is 60mg/kg- so a 10lb dog only needs to consume 300mg of chocolate. Clinical Signs can be seen as low as 20mg/kg- meaning a small 10lb dog only needs to consume 100mg to have problems. Severe signs are seen at 40mg/kg- or consuming 200mg of chocolate. Let’s look at how much theobromine is in certain types of chocolate, then we can best know if you need to be concerned about chocolate poisoning in your dog if he has eaten some. A 5oz milk chocolate bar contains 250mg of theobromine, a dark chocolate bar contains 600 mg. Unsweetened baking chocolate contains 400mg theobromine per square, Semisweet chocolate chips (30 chips), 250mg. Dry cocoa powder contains 700 mg of theobromine per ounce. A poodle weighing 10lbs can be fatally poisoned by as little as one milk chocolate bar containing 250mg of theobromine. 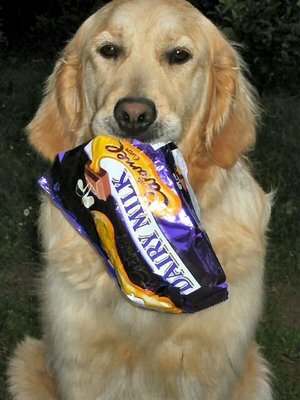 A 75lb larger breed dog, such as a Golden Retriever, would need to eat to eat 8 milk chocolate bars to become seriously ill. On the other hand, the dark chocolate and bakers chocolate are far more toxic; the 75lb Golden only needs to consume 3 of the dark chocolate bars to be fatally poisoned. If your dog eats any amount of chocolate, the first thing is to figure out how much has been consumed. Then based on the type of chocolate, determine if your pet has eaten a potentially toxic amount. 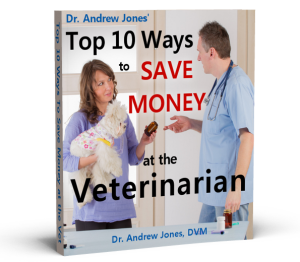 If the dose of chocolate is 20mg per kg of theobromine or higher, you should be seeing your veterinarian and inducing vomiting, or doing this at home. So this means that if your 10lb (5kg) poodle eats a milk chocolate bar, then induce vomiting as he has eaten more than 200mg of theobromine. I have calculated this dose by multiplying the poodle’s weight of 5kg times the toxic dose amount of 20mg/kg giving a level of 200mg. The method I prefer to induce vomiting is by giving hydrogen peroxide at 1 teaspoon per 10 lbs of body weight. If your pet doesn’t vomit in 10 minutes, repeat again. I advise to never do more than 2 treatments of peroxide. You can also try salt: dilute 1 teaspoon of salt in a tablespoon of water per every 10lbs of body weight. If you are unable to induce vomiting, if your dog is showing any serious signs such as tremors, seizures, excessive vomiting, diarrhea, or you are at all unsure please see your veterinarian. You can now see how even a small amount of chocolate can cause serious problems to your dog. As a responsible dog owner, you should be aware of the types of chocolate, and the amounts of chocolate to cause poisoning in your dog. You should be able to recognize the symptoms of chocolate toxicity, and know how to induce vomiting if your dog is to eat toxic levels of chocolate. Thank you, Dr. Andrew. This is extremely frightening and helpful! My mother had bought a 5 pound box of Sees choclates to take to my brothers for Christmas, and left in the bag by her things that were going with us on the road trip. We had 3 dogs at the time of various sizes. One about 11 lbs(doxie), one about 18 lbs (Bishon) and the other about 45/50 lbs (Border Collie) between the 3 of them they demolished the bag, the wrapping, the box and unfortunately the chocolates. Thankfully none got seriously ill (that was by the grace of God alone, how could that otherwise be possible with 5 lbs of chocolates!!!?) However one did have a unpleasant case of diahhrea. Which meant frequent stops on our road trip! I guess my mom didn’t think about them being able to sniff out the chocolates through the box and all, but as we know they have an excellent sense of smell. If you get something like this make sure it’s not on any level like a coffee table or anywhere else that is within their reach. Probably best on a high shelf in a closed cupboard. does the same apply for cats? My 2 poodle/terrior mix breed(12-14 lbs) ate an entire bag of dove dark chocolate that my boyfriend left on the table last Xmas. We induced vomiting but still needed to bring them to the emergency vet have their stomachs pumped and left for 2 days of IV and observation. Not the best of scenarios for the holidays or any time for that matter. It was quite a scare and very costly. Also bad for relationship as I was furious with my boyfriend for not putting the chocolate out of reach. Needless to say, he will never do that again! What is in pet “chocolates” that is different and should they be used as treats? I once gave my little Pomeranian a small bite of chocolate brownies,sure enough he got sick threw up and some diahhrea but survived,never again!! I’ve always known dogs can’t have chocolate, not even a little bit. From a young age I was told never to feed chocolate to a dog. Also I heard onions can be toxic to dogs as well. Best bet here is to avoid giving doggie “people” food and make him stick to his own dish. It’s tempting to give your dog a bite when they look at you with those puppy eyes, but for their own good it’s best to just say no. I had a lovely toy Pom/Maltese cross named Fluffy. Best dog in the world. She was poisoned by chocolate. My uncle from overseas was visiting with us for two weeks and took her for a walk every day. I only found out later that he was taking her to the corner shop and feeding her with chocolate. In ignorance, he thought he was giving the dog a treat. She died an agonising death. It still hurts and I still miss her. thanks for the dosages and the translation to actual chocolate bar sizes. My dog has a sweet tooth and shuns dark chocolate. I have to watch the mocha and chai (caffeine) while traveling as she will raid the cup even if there is no drink. I don’t think this is 100% true. I had a Golden back in the 80’s who lived a full, healthy life of 12 years old and he loved Oreos, M&M’s and other chocolate. He never exhibited any of these “toxic symptoms” you describe. He was very playful and very trim. I would never knowingly poison any animal but is their any Scientific work to validate these claims? Or is it all here-say? Dr. Jones’s article is accurate with regards to chocolate toxicity. Chocolate is dangerous for your dog. Those of you who feed it have just been lucky, or the dogs have not ingested enough to exhibit noticeable symptoms ( doesn’t mean the potential for harm isn’t there!). Please see the link below for the ASPCA Poison Control centre. These are the people the vets call for advice.